That's all from me. To continue the Premier League fun head on over to m'colleague Saj Chowdhury's live text commentary of Watford v West Ham. It is currently half-time and Watford lead 1-0. The BBC Radio Leicester sport journalists were invited over to Claudio Ranieri's home on Friday night to say goodbye to the Italian. They give their full account of the meeting in this Facebook post. You may have to follow the link to read the full chapter and verse - as will BBC Sport app users. More from Sunderland boss David Moyes: “I was disappointed we lost the first goal. We tried to frustrate the supporters. I didn’t want us to concede again in the second half. West Brom defender Gareth McAuley after scoring his sixth Premier League goal of the season: "It's nice to get to 40 points as that was our first target of the season. "We've got there with 12 games to go and hopefully we can push on through the rest of the year. "We put hard work into our set pieces and make no apologies for it. It's a big part of football and it's more difficult to defend against them now with the new rules, the referees are on top of things in there. "I've got the desire to keep going so if they keep giving me a job then I'll keep playing." More from Middlesbrough boss Aitor Karanka: "When you don't come to the game with the right attitude, it's hard to win. "Also, I didn't know George Friend was injured until yesterday so I had to change everything last minute. "We have to keep working. We don't have the spirit other teams have, we don't have the money other teams have to spend - the only thing we can do is keep working together." More from West Brom boss Tony Pulis: "But they've got a great side and great manager. "It's been a great season so far and we don't want to let it go flat. "Look at Ranieri and Leicester - as soon as you become complacement, this game has an unbelievable way of kicking you up the backside. "The one benefit of a small squad is you don't have 10 players out of the team and that can fester. "The players out of the first team here have been good as they know they're close to the starting team." Middlesbrough manager Aitor Karanka: "It is difficult to lose but we have to keep going. "This is not the first time I'm living this situation but the only thing I know is to keep working. "The way we approached the game wasn't the best. I didn't need to say how important the game was to win - I think everyone knew. "I don't know how many times I told them how good we are when we apply pressure. Last week we watched videos of the team against Manchester City and I showed them how good we are when we apply high pressure and go for it. During the second half we did it but it was too late." Sunderland manager David Moyes: “We did ever so well to make sure it was only 1-0. We weren’t good in the first half but got better in the second, we’d earned our chance, but didn’t get the equaliser and gave away a poor second goal. “You’ve got to remember the quality of Everton, where they are and what they’re trying to achieve. There is a gulf in quality, but the players are giving everything they’ve got. If we’re getting let down anywhere, we don’t quite have the quality." West Brom boss Tony Pulis: "It's a great achievement to get 40 points by this time so we're all pleased. "We played well at times, there was the knock back of an early penalty, which was a penalty, but we responded with apomb and had chances to score a third. "But they had chances to equalise late on and Ben Foster has made two great saves. "There's one disappointment though - we've got to be more clinical. "Craig Dawson is OK already, he had a bang on his forehead but he's OK - the players are hammering him for coming off. "The one decision we're disappointed with is when Salomon Rondon went through and Steve Cook ran across him deliberately - Bournemouth were lucky to have 11 men on the pitch after that." Everton striker Romelu Lukaku on equalling Duncan Ferguson’s record of 60 Premier League goals for the club: “It’s been a good journey. Duncan and I work really hard, first with Roberto Martinez and now with Ronald Koeman. They helped me to improve my game and I’m grateful to them, because without them, I wouldn’t have got this far. “I was always sure I would play. My rehab coach in Belgium worked really hard to get my body stronger. When I got back, I had no problem. “Jermain Defoe was unlucky. He is a top-quality striker. He has shown year in year out what he can do. His bad luck was our good luck. Swansea boss Paul Clement, speaking to BBC Sport: "Any game we don’t win we are disappointed by. Chelsea are a very good side, they have fantastic quality and that was the difference. We didn’t have a lot of chances but we came in at 1-1 for half-time and for long periods we defended really well. "There was a big moment with the handball. I thought Cesar Azpilicueta handled it at 1-1, it’s a clear handball. That gives you a chance to go 2-1 up with a penalty but three minutes later you’re 2-1 down after a soft goal. Based on chances they deserved to win, but that was a big moment that didn’t go our way, and who knows what might have happened? "We’ve had a hard run of games. We’ve played Liverpool, Manchester City, Chelsea, and picked up some good wins on the way. Our confidence is not damaged by today. We have belief as we go into a very important run of games now. March is a very important month for us." 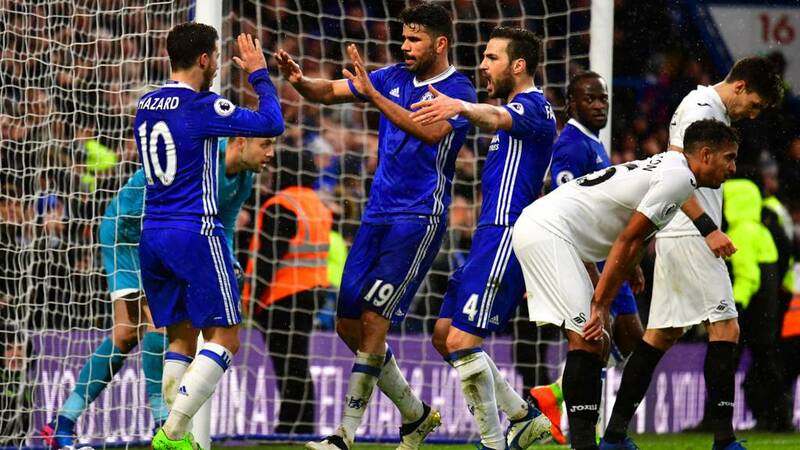 Chelsea manager Antonio Conte, speaking to BBC Sport: "For sure we dominated the game. We played very well, it was a good performance and we created many chances to score. "We conceded at the end of the first half, after the time was finished, so in this case there was a bit of luck, but we showed great character in the second half. We deserved a lot to win the game, now it’s important to continue in this way. To look at ourselves and to think to win, to continue with great focus and concentration." Everton manager Ronald Koeman, speaking to BBC Sport: “It was an important goal for Idrissa. During the whole week, we worked on finishing because we need more goals from our midfielders. It was a nice attack and a good finish. “We know Rom is strong. If he gets the space, he uses his pace and physique. It was a great finish. More from Palace boss Sam Allardyce: "It's a great victory. I think the two-week break helped us refocus and that showed - today they made a lot of very good decisions. "The three points are important as it puts us in amongst the pack, out of the bottom three and a bit closer to Bournemouth. "I see the bottom seven as the Premier League table we need to try and win. If we can achieve more then that would be great but we need to make next week's game against West Brom a game to win. "The lads deserve to enjoy it and relax but we start again next week." That didn't take long. Three minutes into the game at Vicarage Road and Watford are 1-0 up against West Ham. Mauro Zarate is bundled over in the box and the referee points to the spot. Troy Deeney does the rest. You can follow live text commentary of that game here. Everton manager Ronald Koeman, speaking to BBC Sport: “It’s three points, and another clean sheet. I was really pleased by the first 45 minutes, but not by the second 45. I think we dropped the tempo in the second half, and played more backwards than forwards. "We had one lucky moment when Defoe hit the bar. There was a foul on Morgan Schneiderlin in the build-up, and the referee didn’t whistle. But it was a lucky moment. We did it by ourselves because we dropped the tempo in the second half." Crystal Palace manager Sam Allardyce: " Selhurst Park was rocking today. "It felt like they really enjoyed the commitment from the players and really got behind us. "For me it was all about the quality in the first half we continued to pepper Middlesbrough's box with crosses and shots and it came to Patrick van Aanholt and he scored with his weaker foot. We need that sort of quality if we are going to stay up and he has proved himself with four goals this season now - three for Sunderland, one for us. "It's the winning goal and there's never been a bigger win than this all season."